Here is my latest Beginners Fab episode for all of you that are starting out in Fabrication with budget tools. That’s right, I’m fabricating with a few simple tools. One of which just happens to be a Stick welder. What am I fabbing up? Well, this episode focuses on my custom shock mount chassis cross member for my Daihatsu F73/Fourtrak/Rugger. If you don’t know what this project is all about, I’ll give a you a quick overview. I currently have a project rig, which just happens to be a Daihatsu F73/Fourtrak/Rocky/Rugger. Here in Chile, this vehicle is very rare, and I can’t hardly find replacement parts. So, I decided to convert the rear suspension from Coilspring on trailing arms to a leaf spring rear suspension for simplicity of maintaining and repairing the rig. By changing the rear to leaf sprung, I had to the shock mount configuration. Therefore, I had to design and fab up a shock mount chassis cross member that will weld between the chassis rails just in front of the rear axle. This project was fabbed up with a 150 amp stick welder, a 4.5″ angle grinder, some 2″x2″x.125″ square tubing, some .125″ x2″ plate, some 1.5mm cutt off wheels, 60 grit flap wheels, some 5/8″ bore flat washers, and 3/32″s welding rod (6011 green point). At one point, I used some .030″ flux core mig wire with a 50/80Amp gasless mig, but the whole project could be done with a stick welder. 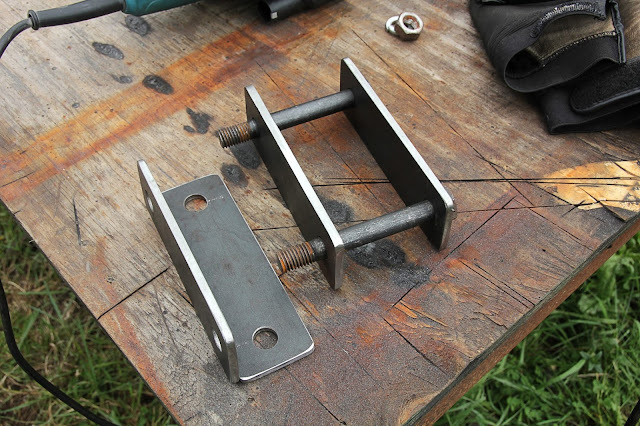 In this episode, I go over a bit of what it took to put this together, a few details, that I had to keep, in mind, and a couple of helpful hints on how to tack weld, while stick welding, so as not to get slag where you don’t want it. So, I hope you find this informative, and enjoy the episode!